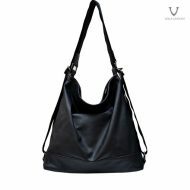 Voila Avira Braided Leather Bag, we created this bag for you who are looking for a handmade quality bag. 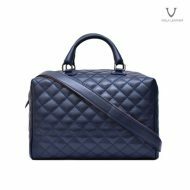 A beautiful, classy BRAIDED LEATHER bag perfect for going to important meetings or parties, the office, or even for everyday everyday daily activities. 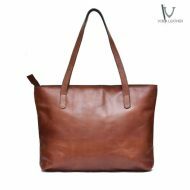 If you are a genuine leather bag lovers and are looking for a classy braided bag, Voila Avira is the right choice. Voila Leather present to you, genuine leather bag lovers, a beautiful designed, best braided leather handbag-sling bag combination patiently handmade by our experienced skilled leather craftsmen using premium pull up cow leather (for the glossy Elegant Black color), or premium naked oily pull up cow leather (for the Yellow Topaz Doff and Emerald Green Doff color), a braided genuine leather bag named Voila Avira Braided Leather Bag. Voila Amira has a long cover lid completed with rotary lock system on top of its longwise shaped, proportional width and height body. Voila Amira’s inner main chamber is wrapped with soft and smooth velvet suede so it is safe for storing your valuables, smartphone or other electronics. Voila Amira’s roomy interior has 2 partitions, 1 zippered middle compartment, 2 spacious main chambers for your valuables, completed with 2 small pouches and 1 medium zippered pocket.